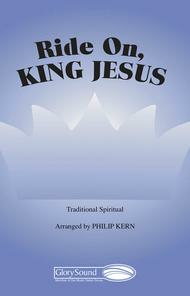 Ride On, King Jesus arranged by Philip Kern. For Choral (SATB). Glory Sound. Choral. 12 pages. Glory Sound #A7993. Published by Glory Sound (HL.35018279).This dynamic arrangement of a beloved African-American spiritual is destined to become an instant classic. Phillip Kern continues to amaze us with the versatility of his work and this festive choral makes your choir sound their very best. The piano writing is scintillating and every bit a match to the bold virtuosic choral writing. Try this happy music for Palm Sunday, Eastertide or Christ the King Sunday. Cleverly done and fun to sing! Ride On, King Jesus arranged by Moses Hogan. For Choral (SATB Divisi). Festival Choral. Festival. 12 pages. Published by Hal Leonard (HL.8703210).Moses Hogan's contemporary settings of spirituals, original compositions, and other works have been enthusiastically accepted by audiences around the globe and have become staples in the repertoires of high school, college, church, community and professional choirs everywhere. Available: SATB divisi, SSAA divisi. Performance Time: Approx. 2:30. Ride On, King Jesus! (Incorporating a traditional spiritual). Composed by Jean Anne Shafferman. Arranged by Patti Drennan. Choir Sacred. 2-Part Choir. Choral (Sacred); Choral Octavo; Worship Resources. Palm Sunday; Sacred; Spiritual; Spring. Grade 2. Choral Octavo. 12 pages. Published by Alfred Music (AP.22836).Passion drama! Incorporating the traditional spiritual, "Ride On, King Jesus!," this dynamic Palm/Passion Sunday anthem vividly portrays the scene: shouts of "Hosanna" from the crowd, palms waving, and King Jesus, humbly riding on a donkey to His death on the cross. Patti Drennan's energetic accompaniment propels the action forward, and Jean Anne Shafferman's dramatic text combines to create the definitive Palm/ Passion Sunday. Suggested scriptures: Psalm 118:1-2 and 19-29, Matthew 21: 1-11, Mark 11: 1-11, Luke 19: 28-40, John 12: 12-36.